Upstream Gallery is pleased to present Fallen Angels, the fourth solo exhibition by Dennis Rudolph with the gallery. Within his most recent work, the Berlin based multimedia artist combines a focus on painting with virtual and augmented reality (VR, AR), dealing with an ideology of failed utopian vision and apocalypse in global history, while drawing a relationship with our contemporary image culture. In his current multimedia project Fallen Angels, Rudolph creates a stylistic fusion that can be referred to as Neon-Baroque, due to the distinctive figures that appear in the work. 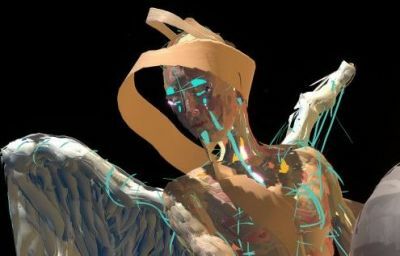 The figures in question are angels, whose form is a fascinating symbiosis of 17th century frescoes paired with the bright digital effects of the VR program Google TiltBrush. This program allows the artist to use his own hands to paint three-dimensionally in virtual reality, then he introduces these paintings into a space of augmented reality. Experienced with an iPad or a HoloLens headset, these immaterial works float as Holograms through the exhibition space of the gallery interacting with Rudolph's oil paintings. Rudolph began using the virtual reality software Google TiltBrush as a medium in 2017 as he was fascinated by the immateriality of the process. The resulting artwork is present and absent at the same time. Additionally, this medium allows Rudolph to paint three dimensionally, plus allows for movement and special effects to feedback with the oil paintings. Refreshingly, painting in the virtual reality has changed the way Rudolph paints ‘in real life’, creating an exchange between reality and virtual reality. The effects made with TiltBrush provide a sense of physical tangibility in an empty space, when holograms emerge into the room from the two-dimensional paintings. The final artwork results in an immersive multi-sensory experience, combining oil paintings, augmented reality and music resulting in a Wagner-meets-Hollywood Gesamtkunstwerk. But in contrast to the perfect illusions of Hollywood, Rudolph's work allows glitches and cracks in the performance giving us an idea of the fragility of our own construction of reality. Drawing parallels to Kleinmichel’s writings on Clement Greenberg’s Avant-Garde and Kitsch, Rudolph’s pieces can be “understood not so much as imitations of the spectacular effects of Hollywood blockbusters and advertising images”, but as more of an analytical and critical interpretation of their processes and functions. Dennis Rudolph (1979) studied at the Universität der Künste, Berlin, the Repin-Academy in St. Petersburg and the Language and Culture Institute in Beijing. Recent exhibitions include the Museum der Arbeit Hamburg; DTLA Film Festival, Los Angeles; KW Institute for Contemporary Art, Berlin; Moscow International Biennale for Young Art; CAC Bretigny, France; Bayerische Staatsoper, Germany; Kunstverein Arnsberg; Künstlerhaus Bethanien, Berlin, among many others. Since 2014, Rudolph runs the exhibition space, residency and studio State of the Art in Berlin.